'cause the manufactures didn't make it! This is my paint rack. Everybody hangs here until complete or knocked off by a cat. 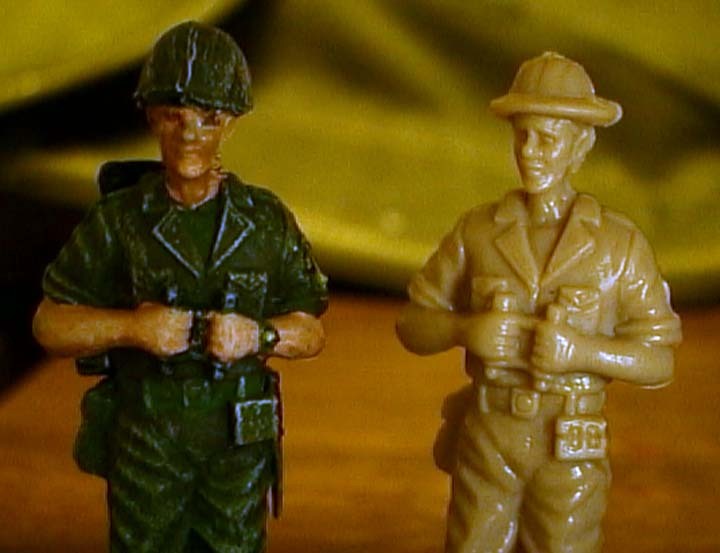 Above is a conversion I am quite proud of...a Toy Major safari guy (2 bucks for a bag of 60) converted to a 1st Cav Division Trooper, 1967. I cut up the bayonet attacking PPC guy, used his M16, helmet, canteen, and bayonet and carved out the safari guys jungle boots and painted the whole deal. You see the beginning and end product. This one was immediately claimed by Monkey 06 for his collection. 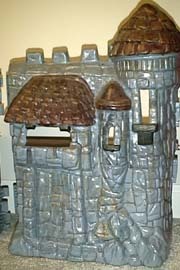 Conversions can be as simple as cutting off a feather bonnet, adding hair with putty and slopping on some paint. 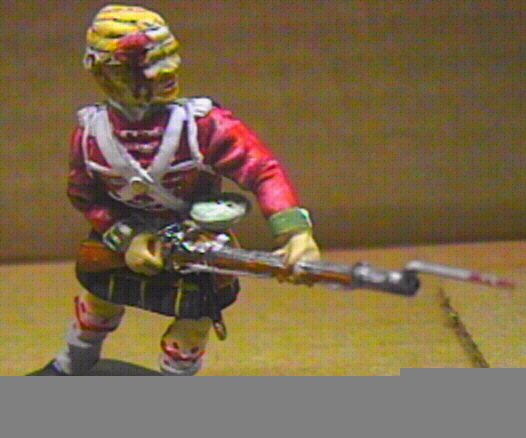 Below, a Timpo Highlander about to exact some revenge for some Frenchie bouncing musket ball off of his noggin. GRRRR!! 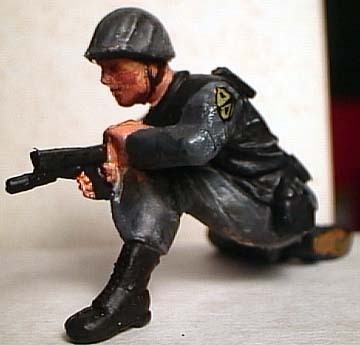 These SWAT cops were made from Processed Plastics Corporation (PPC) US Infantry troops. 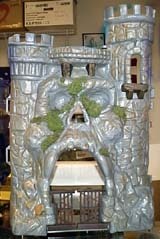 The vast number and availability of these 60mm figures make them an excellent target for conversions. I used the Mortarman and the Machine Gunner for the conversions. Mortar Conversion: The mortar was cut off of the figure and his right hand was taken off as well. 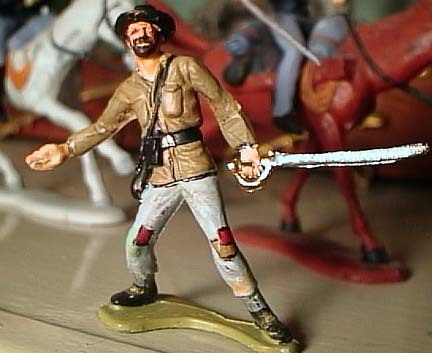 The pistol hand from the PPC Officer figure was grafted onto the mortarman. A pistol mounted flashlight was made from scrap plastic. The mortar shell in the left hand was cut down to represent a smoke cannister. A handcuff case and radio was fashioned from scrap plastic and placed on the belt and back of the figure. Machine Gunner Conversion: The machine gun was cut down to form the pistol in the grasp of the machine gunner. The pistol mounted flashlight on the MG figure was made from the barrel of the MG. A radio and handcuff case was fashioned from scrap plastic. Both figures were given a dark grey uniform and black entry vest paint job. 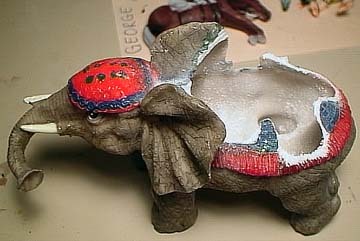 I acquired this resin elephant from the dollar store and will convert him into one of Hannibal's war monsters. 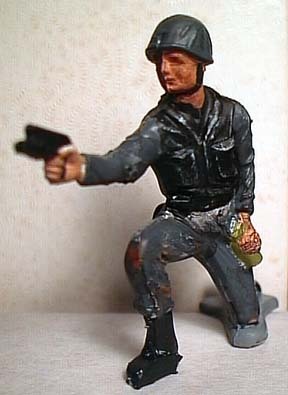 He is pictured with an ESCI Para in 54mm scale. He has a bundle of leaves, baskets, barrels and a drum on his back. In stock trim he could be used as a supply elephant. He would need a paint job as there is some glitter on the colored paint. 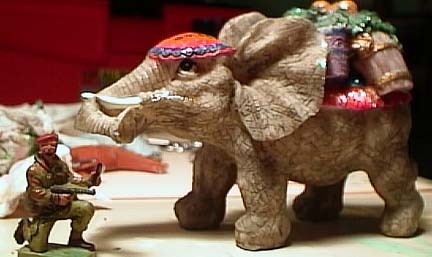 But my project is a war elephant, so the bundle must go. Below is the elephant with his bundle trimmed away. I was able to keep his ears intact. He is hollow, which shouldn't be a problem. As you see in the background, I have several projects going on at once. Typical.